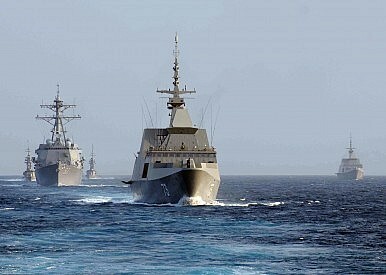 US and Singapore ships during the Cooperation Afloat Readiness and Training exercises in 2011. On July 1, the Singapore Armed Forces (SAF) commemorated SAF Day at a parade officiated by the country’s prime minister Lee Hsien Loong. Ahead of the parade, Defense Minister Ng Eng Hen discussed Singapore’s ongoing efforts to address its defense challenges in a media interview. The biggest challenge Singapore faces, Ng said, is demography. That is not surprising given current and future trends (See: “Can Singapore Overcome its Future Challenges?”). In a speech in May, Ng had revealed that the number of full-time National Servicemen would shrink by about 30 percent from now till 2030. However, he also stressed that the SAF was handling these constraints better than some other militaries, in part because Singapore’s economic growth ensures that its military is sufficiently resourced to make up for reduced manpower with modern systems. He said that the SAF would increasingly rely on equipment – including recently acquired unmanned aerial vehicles (more popularly known as drones), artillery systems and lean frigates – that can be operated with little manpower. He also added that the SAF was looking at new infantry vehicles and ships which combine manned and unmanned systems. Due to these adjustments, he said that based on projections up to 2050, there would be no need to extend the mandatory two-year National Service stint or to make it compulsory for women. That being said, more generally the SAF is looking to boost the number of women within its ranks to ensure that it can mobilize about 300,000 soldiers. For instance, navy chief Lai Chung Han aims to double the number of women in the service in the next 10 to 15 years. The role of women in the SAF has gotten significant attention lately with the announcement of the country’s first female Brigadier General, Gan Siow Huang. Ng also emphasized the need to better utilize the SAF’s existing manpower. For instance, he said that national servicemen who were physically unable to take on combat roles could be used for non-traditional roles in growing fields such as cyber operations. With the advent of hybrid warfare – something that Singapore is especially vulnerable to as an open economy – Lee said that adding these people to this new arena works to Singapore’s advantage (See: “Are We Prepared for Hybrid Warfare?”). “So you now have a new arena where more and more people can make a fundamental difference, even a bigger impact, contribute more, so this works to our advantage,” he said. Ng also stressed that as a small country with a small military, Singapore would be especially vulnerable if the rising nationalism among Asian countries leads to conflict further down the line as it had in Europe and in other parts of the world. “When that happens, small countries suffer first and predominantly,” he said. He underscored the need for Singapore – a tiny country with a primarily deterrent military – to maintain close relationships with neighboring countries like Malaysia and Indonesia.